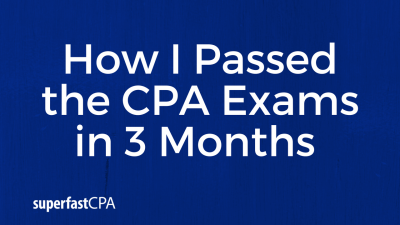 If you’ve failed a CPA exam, in this post you’ll learn how to study for your retake so that you can get a passing score. We’re going to cover the best strategies for a re-study, and depending on what your score was, we’ll cover the timelines or how long you should wait before you re-schedule it. What did you score on the failed section? Should you switch to another section? Okay… let’s help you pass this section. If you scored below a 70, then set your test, your re-test 4 weeks away. That’s perfect amount of time for a re-study if you were below 70. But if you were above a 70, so a 70 or above, somewhere between a 70 to a 74, then you only want to wait 2-3 weeks. You can do a huge amount of re-studying and be very effective. 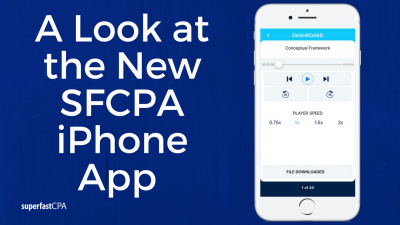 You don’t want to wait too long to retake a failed CPA exam because you don’t want to forget the stuff you’ve already studied. So everything’s fresh in your mind. If you scored a 70 or above, set it for 2-3- weeks away. Now, this one I get asked a lot. Do not try another section first. Do not switch to another section. You spent – I don’t know how long you spent but probably at least several weeks more likely, a month or two, studying for the section that you failed. All that stuff was, to some degree, floating around in your head still. While it’s fresh, you want the hit the re-study, follow strategies I’m going to give you in a minute and just piece it together to the point where you can pass. You do not want to switch to another section until you’ve passed the one you already studied for. Alright. So the best approach to a re-study. It is all based around MCQs. The best thing that you can do is sets of 30 cumulative multiple choice questions. You want to just resemble one testlet like you would see on test day. You want to do those 30 questions over and over and over. Cumulative meaning from all the material. Now, there is, again, depending on your score, if you scored a 70 or above, flat out the best thing you can do to re-study is as many sets of 30 cumulative MCQs as you can handle. Just set after set after set. Two reasons you obviously want to just re-review as much material as you can using these sets of 30 questions. But the other reason is, time management is a killer on test day. Most people spend way too long on the MCQs and they don’t leave enough time to sit and work through the simulations. Especially on this new version of the CPA exam, you have 3 SIM testlets, so you don’t get to look at all the SIMs all at once like you used to. You used to be able to fill out the easier ones first and then work on the hard ones. With this new format, the SIM testlets are split into 3 testlets. And so you have to decide at some point if you’re stuck on one, you have to submit it and move on to the other 2 so that you have enough time to work through the other 2 testlets. The point of all that is that you want to get as proficient with the MCQs as possible. Every section is 4 hours long now and you have 2 MCQ testlets before you get to the SIMs. At the very worst, you need to be done with those 2 MCQ testlets by the 2-hour mark. You cannot go past that. You need to leave at least 2 hours to work through the SIMs. Now, as you go through MCQs, when you come to a question when you’re reviewing your answers at the end of each set of 30, the questions that are the same types or concepts that you keep missing or that you’re still not very proficient with, you want to explain those questions – you want to take the explanation and explain it back to yourself out loud until you understand it and you can explain it to yourself in your own words. At that point, make yourself a flashcard for it. So then you end up with this deck of flashcards you’ve made, whether it’s digitally on your phone, through quizlet or on paper flashcards, you end up with this deck of cards that is in your own words, of all the things you weren’t really clear on before, so that deck of cards is going to be like gold to you when it comes to helping you pass. To recap, you want to do sets of 30 MCQs 2 at a time back-to-back, so 60 MCQs. You take a break in between and read through the explanations. Like we just said, make your flashcards for the ones you missed. Two sets of 30 MCQs, so for each 2 sets of MCQs, then do a set of practice SIMs. When it comes to practice SIMs, you want to seek out the hardest ones because on test day, like you just experienced, the SIMs on test day are going to be harder and nastier than the practice SIMs you’ve seen in your review course. Seek out the hardest SIMs and do the same thing. Break them into pieces until you understand them. Usually that means journal entries, and make your own flashcards for those. So 2 sets of MCQs, 1 set of practice SIMs. That’s the general format. Now, the one difference is if your score was below a 70, then you want to do 2 sets a day. So 2 sets of 30 MCQs from the content areas that you scored weaker on. 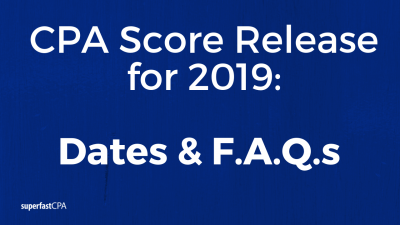 And your score report from NASBA or if you’re not in a NASBA state, whoever sends you that score, your score report will say you were weaker or stronger in certain areas or comparable. You want to hit those content areas that you were weaker on first. Do 2 sets of the 30 questions from your weaker content areas. And then at least once a day, you want to do at least 1 set of 30 cumulative questions from the whole section. Because again you don’t want to forget everything else you’ve studied. You want to keep everything else fresh. You can stay sharp by doing that set of 30 MCQs. If you want an in-depth walkthrough of the SuperfastCPA approach to studying which just involves accelerated study methods, you can go to our website at superfastcpa.com, register for one of our free study webinars where we teach you our approach to studying or you can click on the card at the end of this video.